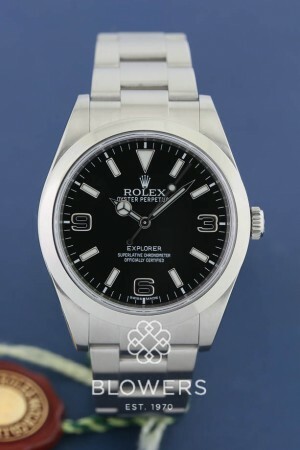 Rolex Oyster Perpetual Explorer 214270. 39mm steel case which is water resistant to 100 meters. Automatic chronometer movement with Parachrom hairspring. Featuring a Black dial with applied luminous hour markers and Arabic numerals with luminous hands, central second sweep. Polished steel bezel. Brushed steel Oyster bracelet with Oyster fliplock clasp. Box and papers dated November 2012. SKU: 3108969. Categories: Explorer, Gents, Rolex.